Sunday 11th September, and it’s an early start for some 500 Thais who somehow all manage to locate a bicycle and converge on the small village of Bo Pang. This annual cycling festival is in part a celebration of the life-giving rainy season, and in part a declaration of the King’s determination to promote greater ecological awareness. Indeed, the whole event was sponsored by the HM The King himself. Chiang Mai eco-youth hit the streets, but the camouflage needs a little work. 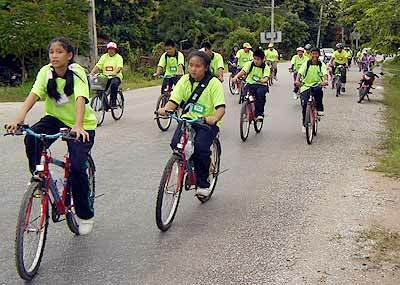 With many wearing green to symbolize the benefits of providing one’s own locomotion, large swathes of Thais, young and old, could be seen cycling gently around the Maejo University and its tranquil and scenic hinterland. Quite a sight! Back at the top of the hill in Bo Pang, some 3 kilometers from the university campus, the more athletic cyclists were crossing the finishing line with their snazzy lycra cycling suits all bespattered with mud (you should get some mudguards guys). A doughty cyclist crosses the finish line in front of his mud-spattered comrades. Now, where’s that free lunch? For those of you who don’t know this area, the land behind Maejo University is attractive rural area, slightly hilly, and a nice option for city dwellers seeking some country air and nice views. 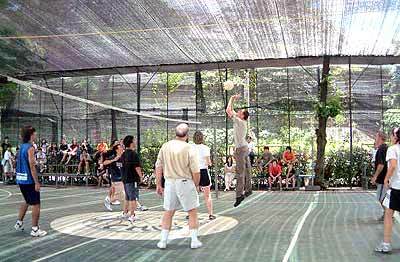 Bo Pang itself boasts an agricultural centre and eco-tourism village, as well as unusual northern views over Chiang Mai city. Hats off to the Thais for waking up so early on a drizzly Sunday and traveling around under their own steam. How many of our farang readers were up and moving around athletically at this time? Hmm, I wonder? 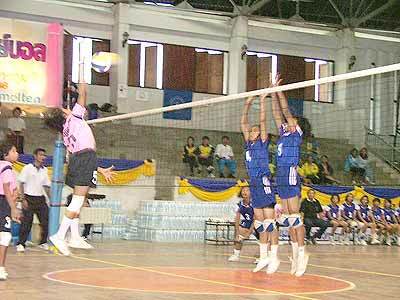 The sixth Aero Thai Mini Volleyball 2005 competitions for under 12s were played from August 29 until September 3 at the Chiang Mai municipality stadium gymnasium. Sixteen teams took part and, in the final round of Chiang Mai level, Baan Tha Look School’s girls defeated Baan Huay Muang School 2-0 to become the champion, while Baan Dong School’s boys defeated Jitra School by 2-0 and is now the male under 12 champion. Baan Tha Look School girls (right) block a ball sent by Ban Huay Muang School. Both male and female champions will be Chiang Mai’s representatives to join the Northern level of Aero Thai Mini Volleyball that will be held on October 17-22 at Chiang Mai’s 700 Year Anniversary Stadium. The final round of this competition on the national level will take place in Bangkok and the champions will receive trophies presented by HRH Maha Chakri Sirindhorn together with scholarships for 20,000, 15,000 and 10,000 baht. Chiang Mai International School (CMIS) teachers and students battled it out on September 2 in a friendly “Friday Noon Activities” volleyball game which saw two teams of students claiming rather decisive victories over their opponents. Rumblings about a rematch were heard from the defeated but not dejected staff members. CMIS students and staff meet on the court. The school provides an opportunity during Friday lunch hours for students in Grades 7-12 to be challenged and engaged beyond the structure of their regular studies through participation in musical, artistic or athletic activities of their choosing. The Council of Culture, Mae Rim district, in association with the parents and teachers club of Mae Rim Wittayakom School, organized a charity bowling tournament at PS Bowling Chiang Mai on September 4. The competition was close, with the top two teams only three points apart. The championship was awarded to the Chiang Mai-German Beer Store team with 873 points, while the runners-up were Northern Badminton Center team with 870 points and Mai Tam Muak Shop team with 867 points. The winning trophies were in the name of PM Thaksin Shinawatra. The objectives of this competition were to build-up a good relationship between the club and committees of Mae Rim Wittayakom School, and to generate revenue to construct a building for students to have a place to study morality. This building will be also be used as a center for art and cultural works. Mae Fah Luang Foundation is to hold a p้tanque, bicycle and running competition to remember HRH the late Princess Mother’s graciousness on the occasion of the anniversary her birth on October 21. Col. Sirode Klaewthanong, deputy secretary-general of Running for Health Association of Thailand said, after a conference at Doi Tung Palace, Chiang Rai, that he was so pleased and honored that the association and members could join this activity. A half marathon of 21 km. and a mini marathon of 13 km. will be run. The overall winner will receive HRH Princess Galyani Vadhana’s trophy and all athletes will receive remembrance medals of HRH the Princess Mother. More details are available at 0 2280 7667, 0 2286 7668 and 0 5371 3004. BH3 female hash (Harriettes) runs once a month on the last Sunday of the month. Pickup from H3 Pub on the corner of Soi 2 at Moon Muang Rd. is at 3.30 p.m. during the winter and 4 p.m. during the summer. 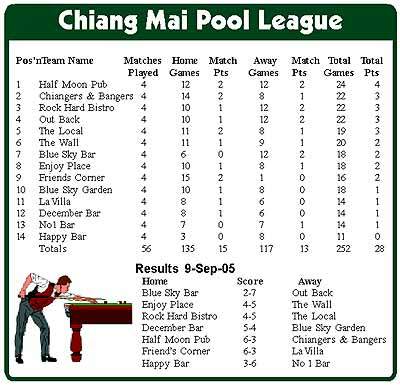 Last week’s 4th ties of the Chiang Mai Pool League saw Chiangers and Bangers beaten out of top position by Half Moon Pub, who remain the only undefeated side so far this season. December and No1 Bars chalked up their first wins of the current term, but Blue Sky Bar and Garden both lost on the same day for the second time in 4 weeks. Don’t worry - be happy. Some of the Happy Bar team members still waiting for their first victory. Half Moon Pub was out to make a point as they shot into a 5-0 lead at home against top of the table Chiangers and Bangers. Although the away side was able to salvage some pride by clawing back 3 games, they now find themselves one behind Half Moon in joint second with Out Back and Rock Hard Bistro. Out Back also got off to a flying start at Blue Sky Bar by winning the first four games, and despite the home team reducing the deficit to 2-4 before the break, Out Back sewed up proceedings by winning all three doubles. Meanwhile, after leading 3-1 at one stage, Blue Sky Garden handed December Bar their first win of the season by the narrowest of margins, 5-4. Perhaps the most exciting game of the night was the nip and tuck affair at Enjoy Place. Going into the doubles with The Wall at 3-3, the result depended on the final black of the evening, and The Wall plopped it straight into a middle pocket to climb from 8th to 6th in the league. Elsewhere, Rock Hard Bistro suffered their first defeat this term to last season’s champs – The Local – which puts the latter back on track after their earlier slip up at Out Back. Friend’s Corner made full use of home advantage with a very good win against La Villa, and No.1 Bar will be mighty relieved to run out 6-3 winners in their bottom of the table clash with Happy Bar. There’s no doubt that winning at pool can bring a great deal of satisfaction and, for some players, rattling off a dozen or so consecutive victories against tourists and bar girls in Loi Kroh Road is the ultimate ego trip. But how really good are we? Willie Mosconi is arguably the best pool player that ever lived. Apart from winning the World Title 15 times between 1940 and 1957, he still holds the record run of potting 526 consecutive balls, achieved in competition at Springfield, Ohio in 1954. During Mosconi’s illustrious career, he also held a record grand tournament average of 18.34 balls, which included the highest run in a single game of 127. But in 1951, Joe Procita knocked in 182 balls on the trot during a World Championship match, ironically against Mosconi. I’ve seen an eight ball clearance in one visit to the table only 4 times in Chiang Mai’s bars. So, however good we think we are, there still seems a long way to go. Although it is early in the season (or because it is early in the season) teams are reminded that come the end of the season if two or more teams are on the same points then the total number of games won becomes the deciding factor. A look at the points/games won for C&B, RH, OB & The Local show this clearly. If it was the end of the season and they were the top four teams The Local would be out of running and C&B, RH & OB would have to play off to decide the winner.